Åsljungasjön just outside the cottage Otherwise it is close to other nice bathing and fishing lakes (at least ten) Very good fishing opportunities in the lakes. to cultural experiences, such as the Glass Kingdom in Småland, Astrid Lindgren's world, the many castles in Skåne eg. Sofiero castle, flea markets in variety and much more. In the evening you can sit in the conservatory and look out over the lake as the evening sun goes down. You are welcome to bring your dog. If you love to ski, it is only about 15 km to Vallåsens fine alpine plant. The cottage is well equipped such as ceramic hob, dishwasher, fridge and freezer, kettle, microwave and m. Fireplace, TV with German channels and internet. Bathroom with toilet, shower and washing machine. Two bedrooms one with double bed and the other with single beds. A large conservatory. Outdoor quality furniture and charcoal grill. A rowboat. Jetty with ladder down into the water that you can swim from. Only a few meters from the cottage to the water. Own parking space for car. In addition, across the lake within walking distance there is a larger bathing area with a hopper. In addition to tranquil shades, the forest offers bush and fungus picking, wildlife and hiking areas. In addition, it is close to both Skåneleden and cycling routes. 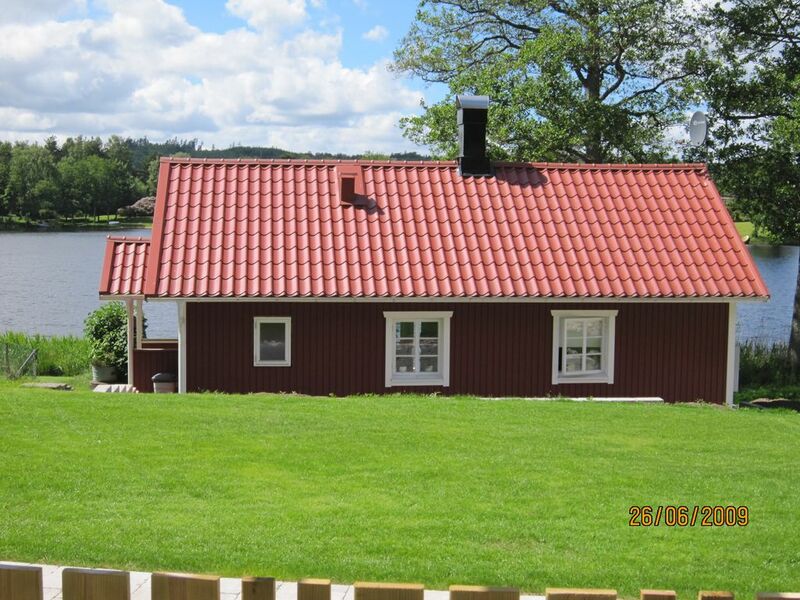 The cottage has everything you need for a cozy holiday and its location, 3 km from Skåneporten, makes it easy for you to quickly reach the destinations. There Åsljungasjön-See lie etwas außerhalb der Hütte. Anxieties lie in the near future, but bathing and anguish (at least zehn). zu kulturellen Erlebnissen was the Glasreich in Småland, Astrid Lindgren's World, the Schlössern in Skåne z. Sofiero Palace, Flohmärkte in Vielfalt and much more. In the evening, you can sit in the open space and watch the sun set at sunset. Gerne können Sie Ihren Dog mitbringen. If you want to ski, you can reach the beautiful Alpine Anlage von Vallåsen just 15 km away. The cottage is well equipped with ceramic, glass, glass and freezer wash, wash basin, microwave oven, etc. Fireplace, TV with duvet and internet. Bathroom with WC, shower and washing machine. Two slatted bedrooms, one with double bed and the other with single bed. A larger glaze Wintergarten. Outdoor quality furniture and wooden grill. A rowing boat ladder with water in it, can get them swimming. Nearly wet meters of the lake to water. Owner's parking space for the car. On the other side of the sea, there is a larger bath set with a spring turbine. Next to the rugged lights, the forest also offers bears and pebbles, wildlife and hiking areas. Otherwise, it lies in the vicinity of both Skåneleden and von Radwegen. The holiday home does everything, you need for a common url. Die Lage, 3 km from Skåneporten enters, makes it easy to find, get the soul quickly. Lake Åsljungasjön just outside the cottage Otherwise, it is close to other nice bathing and fishing lakes (at least ten.) Very good fishing opportunities in the lakes. In the evening you can sit in the outdoor room and look out over the lake when the evening sun goes down. If you like to ski, it is only about 15 km to Vallåsen's fine alpine facility. The cottage is well equipped, such as ceramic hob, dishwasher, fridge and freezer, kettle, microwave etc. Fireplace, TV with German channels and internet. Bathroom with toilet, shower and washing machine. Two bedrooms one with double bed and one with single beds. A large glazed conservatory. Outdoor quality furniture and charcoal grill. A rowing boat. Jetty with ladder down to the water that you can swim from. Only a few meters from the cottage to the water. Own parking space for car. Across the lake there is also a larger bathing area with a jumping tower. In addition to the serene, the forest also offers berry and mushroom picking, wildlife and hiking areas. In addition, it is close to both Skåneleden and to bike trails. The cottage has everything you need for a cozy holiday and its location, 3 km from Skåneporten, making it easy for you to quickly reach the destinations. Thank you very much for the fine review. You are very welcome here again. Underbart boende precis vid sjökanten. En liten välfungerande stuga som överträffade våra förväntningar. Luftkonditioneringen var vad vi värdesatte högst, då det var så otroligt varmt den veckan vi bodde där. Välutrustat kök med diskmaskin. Ägarfamiljen är mycket trevliga, och bor i närheten. Ett litet minus var att badtrappen var svår att klättra på, gick lite inåt, så den var svår tyckte vi. Vi kommer gärna tillbaka, då vi trivdes förträffligt! Das gut ausgestattete Haus liegt direkt am See(keine 4 Meter). Ein sehr gutes Boot liegt dort direkt am Steg. Wer seine Ruhe will, absolut zu empfehlen! Wir fanden für die Grösse und das Angebot (keine Bett- und Küchenwäsche gestellt, Strom und Internet extra bezahlt) teuer. Schade... das hinterlässt einen etwss komischen Nachgeschmack eines sonst netten Plätzchens. Wir haben im Juli/August 2017 2 Wochen dort Urlaub gemacht und waren total begeistert. Wir waren zu viert dort 3 Erwachsene und 1 Kind. Sehr schöne Unterkunft, tolles Ferienhaus für erholsamen Urlaub, super ausgestattet von der Küche bis zur restlichen Einrichtung, Angelboot mit Motor ,überdachte Terrasse wo man auch bei Regen sich super wohl fühlt . Bootssteg direkt hinterm Haus , angeln , baden alles möglich. Wir waren 2016 zwei Wochen mit vier Erwachsenen und zwei Hunden und 2017 drei Wochen mit zwei Erwachsenen und einem Hund in Åsljunga in dem roten Ferienhaus. Das Ferienhaus und die Umgebung sind so, wie auf den Fotos dargestellt und wie es in der Beschreibung steht. Wirklich traumhaft schön! Es gibt mehrere Supermärkte, einen Systembolaget, eine Bank, eine Apotheke sowie einen Tierarzt in Örkeljunga. 2.) Den wirklich wunderschönen, abwechslungsreichen Weg um den See (ca. 1 Stunde). 3.) Die Nähe zum Wasser. 100% Empfehlung! Wir kommen wieder! 20 km to the Elk Park, Mini Golf 7 km. There are many lakes in the area. Fishing access is required for access to fishing. 35 km Hembygdspark in Ängelholm with animals and an obstacle course in the tree tops.